If you want to please a crowd, you really can't go wrong with cheesy toast! 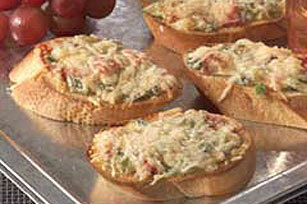 Although Toasted Romano Crostini is a more elegant name for it. When eating appetizers at a social occasion, preview your choices and decide which you’d like to try instead of taking some of each. Substitute KRAFT Grated Parmesan Cheese for DIGIORNO Shredded Romano Cheese.